Tallahassee Mayor Andrew Gillum may be a rising star but at his core, he's a family man. If Tallahassee’s mayor, Andrew Gillum, and his wife, R. Jai, ever decide politics and community enrichment aren’t really their forte, a joint career in standup comedy is a viable option. Seriously — this twosome is funny. Need an example? Just ask the vivacious pair how they met. “There are two different versions to that story,” laughed R. Jai, 37, executive director of United Way of the Big Bend’s The BEST Project, which helps people achieve long-term financial stability and quality of life through services such as tax preparation help. Classmates at Florida A&M University, the pair first crossed paths in the late 1990s and early 2000s during their days in the Student Government Association. It might not have been love at first sight — but it was pretty close. “I was in a business suit,” insisted R. Jai. His tactics were, admittedly, ill received. The pair never dated while at school. Following her graduation, career opportunities took R. Jai away for a few years. When she returned to pursue graduate school in 2003 — right after Andrew “The Kid” Gillum became the youngest person ever elected to serve as a member of the Tallahassee City Commission — fate brought them together again. And once again, they botched it. The chance encounter occurred at Governor’s Square mall, at a time when Andrew was still trying to forge his way as an up-and-comer in Tallahassee’s political arena. He was toting two cell phones and a pager — a “tell” to the intuitive R. Jai. The pair chatted for a bit. Before parting ways, Andrew scratched down his number. She might not have called — but she did manage to hang on to that piece of paper. If you ask nicely, she might just show it to you. She’s kept it safely tucked away for almost a decade now. “Of course she never called,” Andrew said with a laugh. A few months after their impromptu mall run-in, mutual mentors at FAMU had grown tired of R. Jai and Andrew’s shenanigans. Utterly fed up, they not-so-serendipitously arranged yet another meet-cute for the two overachievers. Andrew and R. Jai promptly arrived, not knowing the other would be there. Luckily, the third time was the charm. This go-around, something clicked. They made plans to get together the following weekend. Roughly five years, several promotions and a few elections later, and it was proposal time for the fun-loving, successful couple. Ever the perfectionist, Andrew mapped out their day flawlessly. He would pop the question during a romantic vacation to California’s Wine Country, where he would woo her with a horseback ride through a local vineyard, followed by dinner and wine amongst the grapevines. So beautiful — and so not how the day went down. After a few moments of calm, R. Jai realized what was going on. “I got down on one knee and asked her if she would be my life partner,” beamed Andrew. “She said yes. “She was nasty slobbering,” he teased. After the wedding, the couple wanted to enjoy their time together as newlyweds and further build their careers. They decided to wait a year before having children. Sadly, conceiving was a much longer road than they could have imagined. But on May 19, 2014, R. Jai gave birth to twins — a healthy, beautiful baby boy and girl they named Jackson and Caroline. Since the birth of their children, R. Jai has taken to opening up more about their experience. As Tallahassee’s first lady, letting community members in similar situations know that they’re not alone is a cause near and dear to her heart. Over the next four years, she plans to address the emotional issue more directly. Andrew, pleased with her decision, said he’s seen her words help people close to them. Somehow, though, the couple says they managed to emerge from their trying four-year fertility issues closer than ever. Their secret? Remembering that they were in it together, and never forgetting to smile. They swore they wouldn’t let their heartbreak tear them apart. 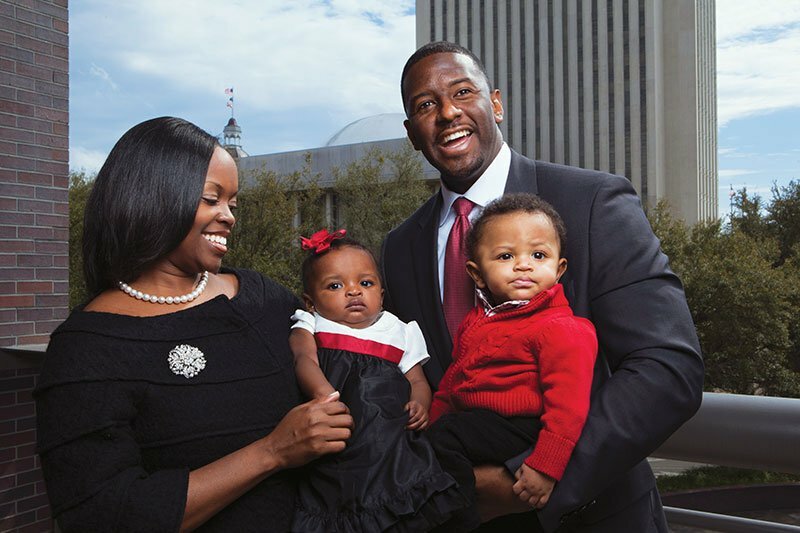 Today, the Gillums say they’re stronger than ever. From going on dates to implementing a strict no-cell-phone policy in their household, the couple has found a balance between work and their family. “R. Jai and I have a lot of fun,” admitted Andrew.